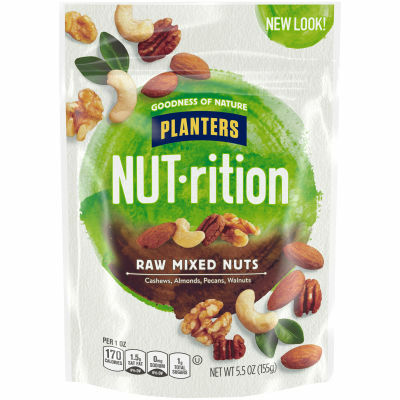 Planters Raw Mixed Nuts - Planters uses only its premium quality nuts in this NUT-rition mix to ensure freshness, flavor and crisp texture. This mixture of nuts is unprocessed, pure and simple, delivering you natural tasting cashews, almonds, pecans and walnuts in each handful. This raw nut mix delivers multiple vitamins and nutrients, containing no other ingredients but the four nuts listed. When you're craving a crunchy snack, reach for this bag of Planters Raw Mixed Nuts for a wholesome treat.